(Note, to understand the particulars of this case please read A primer on the Faith Fellowship v. San Leandro lawsuit first). The 9th circuit court of appeals has just denied the City of San Leandro’s petition for an en banc hearing of the apellate decision against the City on the Faith Fellowship case. None of the 29 9th circuit judges requested to hear the case. That is of little surprise, the petition not only had no merit but was terribly and insultingly written. It was so bad that I’ve argued that it should be grounds to fire Meyers Nave, the law firm that represents the city and wrote the petition. The City Council will be meeting next Monday in closed session to discuss what to do next. They have three choices: appeal to the Supreme Court, go to trial or settle. I daresay that City Attorney Jayne Williams will recommend the first option. A Supreme Court appeal will mean that Meyers Nave gets to charge the City even more money on attorney’s fees. It also allows Williams to continue telling the City Council that the her firm’s advise to deny Faith Fellowship’s rezoning petition was correct: the 9th circuit just got it wrong. Most members of the San Leandro City Council are not very astute legally and may not realize that not only are the chances of the Supreme Court taking the case minute, but in all likelihood the current conservative, religious-loving Supreme Court would not side with the city against the church. It is thus possible that the City Council may go along with Williams. An appeal would slow down the case, putting off paying the church’s damages for some years, but it will increase the legal costs for the city. Going to trial presents significant legal risks to the city. 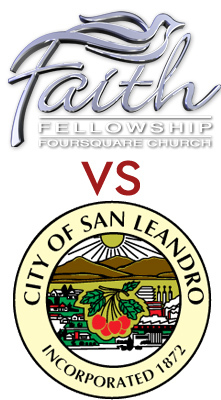 The facts are with the Church: former City Manager John Jermanis himself said that there we no other properties suitable to Faith Fellowship’s needs in San Leandro. The City led the church on for a year, suggesting it would let it use the property if the church jumped through enough hoops, only to deny them the use of the property after they had bought it and for what looks like arbitrary reasons. I think a jury, looking at the facts, is likely to agree with that conclusion. But even if it doesn’t, the church still gets to re-appeal the case to the 9th circuit on “equal protection” grounds, and the 9th circuit panel that heard the case originally hinted that it would side with the church. Personally, I think the substantial issues on this case are already lost: the city violated RLUIPA and the church is entitled to “appropriate relief”. The question the city should be addressing is what that means. RLUIPA provides that “a person may assert a violation of this Act as a claim or defense in a judicial proceeding and obtain appropriate relief against a government”. It also provides for attorney fees’ for the prevailing plaintiff. While it is universally accepted that this “appropriate relief” includes injunctive relief and that the court could order the City to allow the church to operate on the Catalina St. property, Faith Fellowship no longer owns said property. It was forced to sell it last year, for $2.5 million under what it paid for, when it could no longer afford to pay its mortgage and run its existing facilities at the same time. Faith Fellowship has indicated that at this point what it seeks are monetary damages, the $1.2 million that it made in mortgage payments while it owned the property and perhaps even the $2.5 million it lost when it sold it. But it is not clear that RLUIPA allows for money damages. While some courts have found that it does, following the Supreme Court’s reasoning in Franklin v. Gwinett, the US Supreme Court just ruled in Sossamon v. Texas (in a case involving prisoners’ religious rights) that the phrase “‘[a]ppropriate relief’ is open-ended and ambiguous about what types of relief it includes” and that, at least in the case of lawsuits against states (which, unlike municipalities, enjoy sovereign immunity) it should not be interpreted to include monetary damages. Now, because the Sossamon court ruled on very specific circumstances, it’s not clear how lower courts will interpret the decision. They may very well conclude that it would be inconsistent to read RLUIPA’s grant of “appropriate relief” to include monetary damages when the state actor is a municipality or county, but to not include them when the actor is a state. Or they may decide that the fact that Supreme Court specifically differentiated Sossamon from Franklin means that Franklin applies to non-sovereign RLUIPA defendants. Personally, I think the latter is the more compelling interpretation of the Sossamon decision, but I think that the City (if it hired a good law firm to represent it) could make a viable argument that “appropriate relief” does not include monetary damages. At the very least, the City should be able to convince the court to limit those damages. But litigation is expensive. The City admits that it has spent $450,000 pursuing this case so far, though the real amount may indeed be higher. It will likely be on the hook for Faith Fellowship’s attorney fees as well – which may very well be higher than the city’s. A trial, even if purely on the money issues, and the appeals that would follow it, would prove terribly expensive. Personally, I think the city needs to do whatever it can to settle the case – as long as Faith Fellowship is reasonable on its demands. Now, the City Attorney should go to the City Council and put the figures on the table: this is how much we’ve spent so far, this is how much we’re on the hook for the Church’s attorney’s fees, this is how much more we’re likely to have to spend if we go to trial and lose. Then, based on those costs and on Faith Fellowship’s damages, the city should make a reasonable settlement offer. Without knowing those figures, I’d say something like $1.5 million plus attorney’s fees seems reasonable. City help in identifying and rezoning a suitable property should be part of the deal as well. It would behoove Faith Fellowship to accept such a settlement as well: they could get the money now rather than in a few years. That would mean they could go on and buy a new property now – when prices are still low – and be able to move soon rather than years from now, when all the litigation would be finally over. I can only hope that both sides will see reason. Update 10/11: The City appealed this case to the US Supreme Court last summer, their appeal was denied.